About a week ago our Golden Retriever turned six years old. No longer a puppy. So we celebrated by getting all maudlin as we remembered our former dogs. 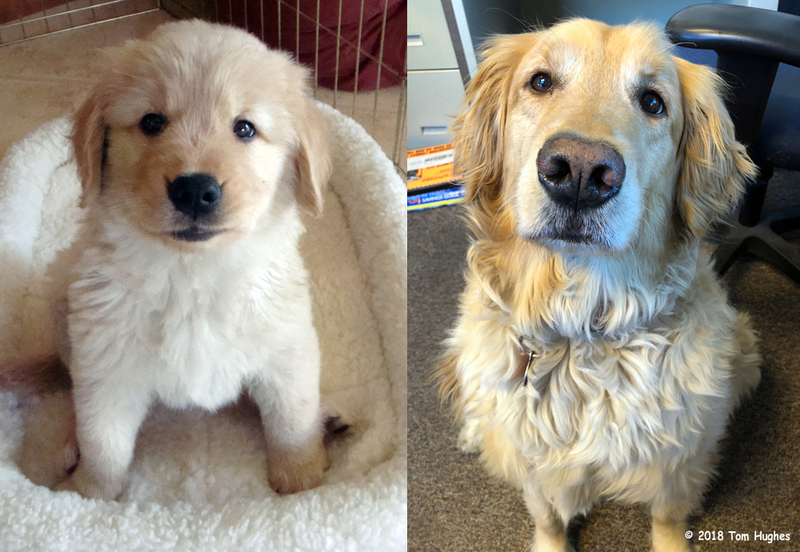 Be that as it may, here’s our girl at 8 weeks and at 6 years . . .
Our Flirt’s mother is also named Flirt and her father’s name was Chance (the dog all over Jan’s feet at the end of the video below). We got our Flirt as a puppy from Dichi Goldens in Wisconsin in 2012. Before we picked her up in November of that year, we visited Dichi in June, a month after our previous Golden Retriever Jack died. Here’s a movie of our visit to Dichi Goldens in June 2012 . . . Happy Birthday, Flirt. You’re not just any blond beauty. What a winner!